Aqua Safari Adventures is a scuba training, travel and charter company based in Palm Beach county Florida. Our services are designed for those seeking the highest quality. Aqua Safari Adventures is unique because we specialize in personalized service to custom fit the individual scheduling and training needs of each client. Whether you want to earn scuba certification, enjoy an exciting dive vacation, or achieve dive leadership level status Aqua Safari Adventures has the quality programs for you. You will be very pleased with your choice of Aqua Safari Adventures for your dive training, travel and charter arrangements. Our commitment is to provide you with the very highest standard of service. When it comes to your safety and enjoyment should it be anything less? Please check out our Services page for more details about our Scuba Training, Charter & Dive Guides, and Travel programs. 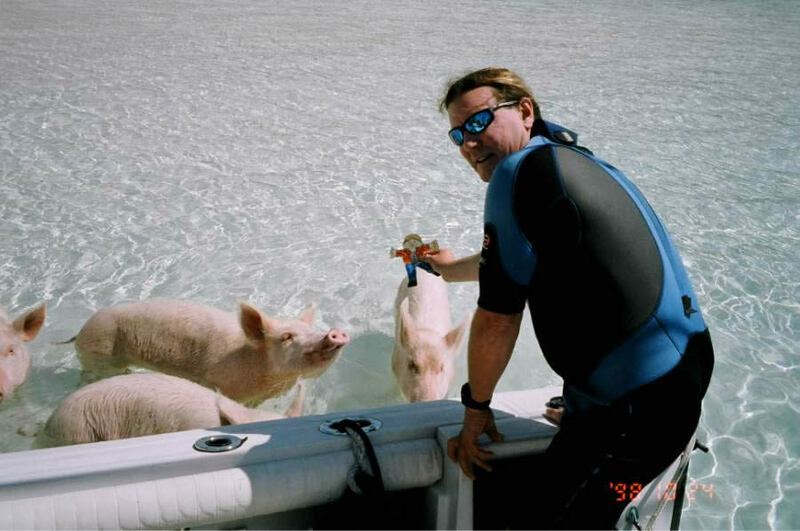 Description: To those of you who know and love Dave Ochs as "Chancho", here are some pictures of him last week in the Exumas having a close encounter of the 4-legged porcine variety! Designed and hosted by Unique Web Sites, Inc.